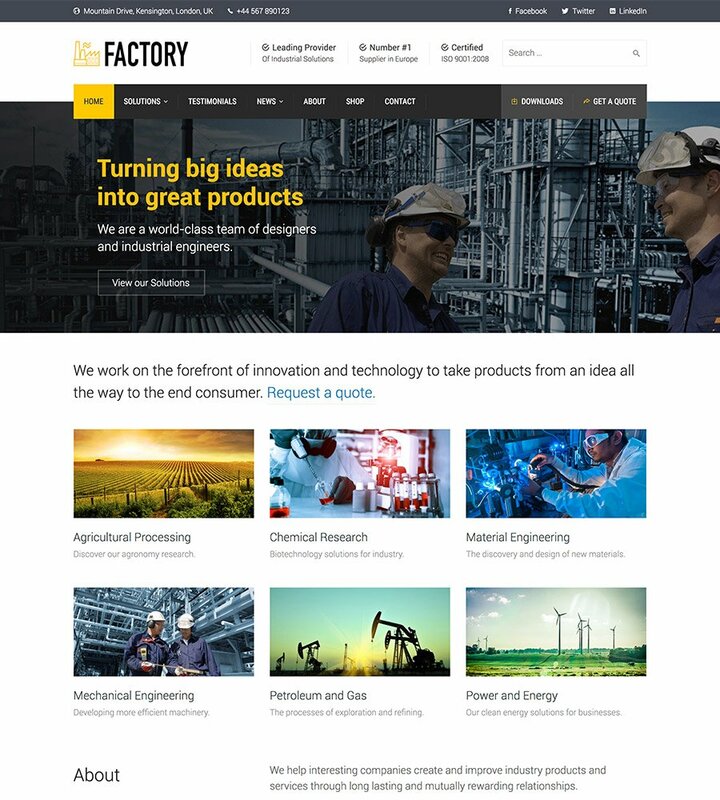 Factory is a best-selling precision designed WordPress theme for industrial and construction firms. Factory is the original and still the best. It has spawned dozens of imitators but this original industrial and manufacturing WordPress theme is still a perfect fit for businesses focused on those sectors. With crisp, bold typography and a memorable default color scheme your firm’s website will look fantastic with this theme. Plus, it’s a best-seller on ThemeForest with over 1,700 happy customers so you know you’re in safe hands. Factory includes dozens of beautiful default template designs including landing and services screens. Your firm’s offerings will look fantastic with our theme’s design. With the Visual Composer page builder, you’ll be dragging and dropping elements into place in no time at all. Factory includes a list or grid-based layout for your news or blog posts. Keep the site up to date with the latest progress and updates. Factory includes a beautiful responsive layout so on mobile or desktop screens the results will be perfect. Wow. This is my first time giving a review but they just didn't leave me no choice other then to sing songs of praise. These guys not only answered all of my questions/requests within 24 hours, they even provided actionable support and fixed issues individually on such short notice.